I’m convinced that a website’s most important measurable metric is conversions. Because that is true, we need put traffic in its proper place. I think you should quit worrying about your website traffic. Let me be extremely clear before I proceed. I am convinced that both SEO (i.e., traffic) and CRO (i.e., conversions) are important. Both of these contribute to the overall business goal of revenue. However, I see a problem: Many marketers obsess over their website traffic to the neglect of conversions. Is traffic important? Absolutely. I’m not opening up the SEO vs. CRO can of worms here. Both are good. 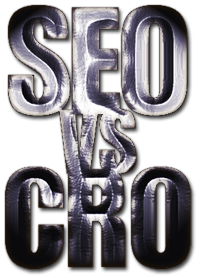 If you’re interested in my take on the issue, CRO and SEO aren’t enemies. They’re allies. This article is intended to correct the mistaken notion that increasing traffic is the best means of increasing revenue. 1. High website traffic is a misleading measure of success. Your traffic does not indicate how successful your website is — unless your primary goal is to get more traffic. And who has that as their goal, really? If a website has the simple goal of traffic, its managers are tragically misguided. At the end of the day, website traffic is primarily a vanity metric. ...The biggest benefit of measuring traffic metrics comes from establishing bragging rights amongst your peers. Sometimes I wonder if the Internet turned us all into a bunch of traffic junkies. I wonder the same thing. Especially the entrepreneurs among us, we crave traffic like a worm craves wet dirt when it’s squirming on a hot sidewalk. But where does this craving, crawling and conniving for higher traffic stats get us? It might get us a bigger number on Google Analytics, but that’s about it. More traffic is misleading. When we get it, what have we gained? We haven’t boosted our revenue. We’ve boosted our ego. That traffic is an empty number. True e-commerce success is not defined by the traffic. 2. Traffic is an undefined audience. Nearly every website is designed to speak to a certain audience. Sometimes, this audience is very broad; sometimes it’s very narrow. Amazon has a really broad audience. Their audience consists of anyone who lives within their global shipping network and wants to buy something. MacRumors.com has a narrow audience. Their audience consists of people who own Apple devices and want to find out more news and rumors about Apple’s products. More traffic is only valuable if it consists of people who are part of your target audience. Many times, grasping for traffic produces visitors who have absolutely no interest in the product or service being sold. It’s empty. It’s like cotton candy. Tastes good. Feels horrible when it gets stuck in your hair. SEO should bring in the traffic that comprises individuals who are interested in purchasing a given product or service. It’s not an indiscriminate clutching at numbers. It’s a focused effort to gain only the traffic that truly matters. Sheer traffic is an unqualified audience. 3. Higher traffic does not necessarily produce greater revenue. Traffic alone does not create revenue. What does traffic create? It creates visitors. Do visitors convert? Some do and some don’t. Let’s look at a few hypothetical numbers. What’s the deal here? Website 1 gets 99,900% higher traffic than Website 2. But it gets 50% less revenue? I made these numbers up in order to make the math simple and obvious. But my cherry-picked numbers aren’t too far off from the reality of some websites. Without conversion optimization, some sites are converting at abysmal rates. I’ve seen lower than 0.01%, the number that I used in my example above. With conversion optimization, conversely, some sites are converting huge percentages of their traffic. And, yep, I’ve seen conversion rates higher than 15%. Here's an example showing the profits generated by 20,000 additional visits compared to an increase of 0.3% in conversion rates. I kinda prefer the higher revenue. (Not sure about you.) The revenue produced by conversion rates increases is vastly superior to the revenue produced by more traffic. More traffic doesn’t mean more revenue. The real wins come from conversion rate increases. 4. Traffic produces negligible returns. I’ve watched marketers spend vast amounts of time, money and effort on generating traffic, only to see tiny returns. Boosting traffic by 25% may feel good and sound good, but is it good? If that traffic isn’t converting, then, no, it’s actually very bad. Your efforts are in vain. You’re simply glutting your website with wasted clicks, higher bounce and lower conversion rates. None of that is good. Let’s go back up to my hypothetical example of the two websites. How much time, effort and money did it take for the owner of Website 1 to get his traffic that high? A whole lot. He probably paid consultants, bought ads, hired SEOs, and stayed up late to work that kind of traffic-generating power. What did it get him? Zilch. How much time, effort and money did the owner of Website 2 go through to keep his traffic at 100 uniques a month? Probably not a whole lot. Instead, he read this blog, ran some simple tests, and made a few changes. And went to bed on time. And attended his kids’ baseball games. Win. Win. Win. And his revenue is higher. Win. The ROI of bigger traffic just isn’t there most of the time. The real value increase comes from better conversion rates, not higher traffic rates. If you’re not clear on this point, do a little homework. How much did your traffic cost to get? Maybe you can isolate the CPC of a single landing page to make the math simple. How much revenue did you make from that single landing page? Now, put the issue into a slightly different perspective. Maybe for you, it’s a hypothetical perspective. What if you were to hang on to that AdWords money, content yourself with your existing levels of traffic, and perform a few A/B tests. Then, using the data from the test, make some adjustments to your website that boost conversions. He spent one morning redesigning the purchase process of his e-commerce website. Here are what his site’s monthly earnings looked like for the first six months of the year. In May, David started making bank. He made those conversion optimization changes in the beginning of May. He didn’t improve his traffic. No surprise there. It’s about conversion rate, not traffic. If this blog is strangely reminiscent of the proverbial broken record, sorry not sorry. 5. Traffic takes a long time to build. Building traffic is like building a house brick-by-brick. It takes a long time. There are hacks, tricks, boosts and tricks, of course. But the reality is this: Creating a steady stream of legitimate organic traffic is a long, hard process. Ask any big-shot blogger how long it took him or her to build a massive following. Their answer will probably have the word “years” in it. The best way to gain traffic, of course, is to produce high-quality content. But the plebeians of the interwebs don’t just automatically find all that great stuff. It takes time. Algorithms, people, search results, and Beyonce’s latest hit all make the entire process slow and gradual. It ... is not economically viable for a small business. For larger companies, it will likely require a multi-year, multi-faceted approach. Gee, thanks! Now, let me just go enjoy myself for a while now that I’m all cheered up! And they provided the answer. "I would say the average for most companies, who intelligently blog at least 2-3 times per week, is 6-12 months." Okay, we’re down to a year. One year. More traffic. Let me provide a little comparison. How long does it take to run an A/B test on your existing traffic and make some tweaks? It takes a few weeks, max. And by doing that, you could jack up your conversion rates by some pretty dang fat numbers. The traffic that you clawed for over a period of 12 months may or may not convert. Website Optimization ran some numbers to determine traffic gains compared with their position on Google and the conversion rate. It’s no surprise that a better position on Google produces more traffic and higher conversion rates. What’s interesting is that it takes a lot of time, cost and effort to produce these gains. The conversion rate improvement does not improve by a higher percentage than the percentage increase of the traffic. The percentage of increase in traffic is roughly equal to the percentage increase of the conversion rate. That’s what SEO does. But CRO does something different. It affects your conversion rates directly, which leads to a direct impact upon revenue. The harsh, cold reality of this marketing climate is that you ain’t got no time to build traffic if it’s not going to give you substantially more revenue. 6. Traffic produces unqualified leads. I mentioned earlier in this article how sheer traffic alone is an unqualified source of leads. I also mentioned that the only good traffic is targeted traffic. Traffic increases should be viewed as a positive thing only if that traffic also converts. In a study on the conversion likelihood of website leads, HubSpot discovered that the only traffic that mattered was the traffic gained through inbound methods, i.e., blogging, content marketing, etc. Most people will be attracted to inbound marketing to increase their traffic and leads. But who knew it could also optimize your lead-to-sale conversion? Inbound marketing makes you think through your entire sales funnel, and optimize each part effectively. It wasn’t just the boost in traffic. It was the increase in qualified traffic. Traffic is essential. It always has been. Always will be. Without traffic, you have no visitors, no conversions and no revenue. But does traffic need to be your driving obsession? Yes, traffic should be your driving obsession if you have no traffic whatsoever. No, traffic should not be your driving obsession if you have a decent amount of traffic already. I’m not writing simply to poo-poo traffic I’m writing to emphasize the importance of conversion optimization. The fastest and most guaranteed way to improve your conversions, and therefore your revenue, is through conversion optimization.